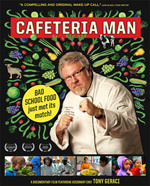 The CAFETERIA MAN DVD is available for home and community screenings, and for classroom use, to inspire your community to support healthier, locally grown food for kids in your schools. Choose one of the options below depending upon the type of screening you'd like to organize. Download the free COMMUNITY SCREENING ACTION GUIDE to help you organize an effective event, and PUBLICITY MATERIALS to promote your screening. Visit the CAFETERIA MAN WEBSITE for more resources.